"Florals? For Spring? Groundbreaking." But I'd rather say YES, please! All year round. I mean, who can resist spring flowers? With their brightness and colors make everyone happy and are a huge source of inspiration. 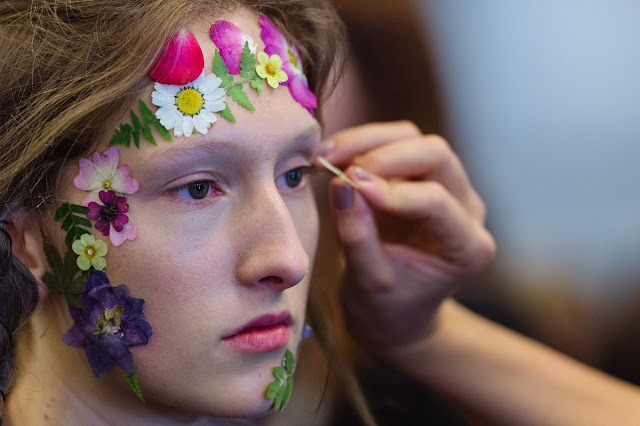 But even if face flowers are the new flower crown this spring, the look is kinda daring even for a huge flowers lover as me; I don't think the world outside is ready to see it, right? What's your go-to spring makeup? La penso come te, sarà scontato ma i fiori in primavera sono stupendi! Neanche io riesco a resistere ai fiori in primavera!!! Li adoro anche io, primavera il risveglio della natura! Of cause I love flowers, but flowers in the face for real life? No, I'm not ready and will never. :) May for carnival. But the colors of these flowers are inspiring for a fresh make-up. if you ask me I'd vote for such flowers. I'm not sure if I could wear them on me but would definitely like it on other bloggers! i always go for cateyes and red lipstick! So pretty. These make-up artists are so creative.